Today is Father In-Law Day. Do something nice for your better half's old man today. Consider taking him out for a beer and letting him know how much you appreciate everything he did for your spouse over the years. Who knows, he may just repay the favor someday with a beer for you. Here's what's happening around the Colorado beerosphere today Monday, July 30th, 2012. Kokopelli Beer Company (Westminster) - Come out this coming Saturday, August 4th from 2pm to 5pm for a beer tasting at the Denver Elks right off of I-25 (Red, White & Brew II). It's a fund raiser for the Freedom Service Dogs for our Veterans. Kokopelli Beer is going to be serving at least 8 of their test batches for you to try ~ till they run out. They'll even have some Oktoberfest Ale. There will be other brews there too. After the 3 hours of tasting they're going to have an awesome dinner. Reservations for dinner are separate. More info + tickets here. Great American Beer Festival (Denver) - This is the week! Tickets for the 2012 GABF go on sale THIS WEEK! AHA Member tickets go on sale July 31st at 10am MDT and General Public tickets go on sale August 2nd at 10am MDT. This event will sell out quickly, perhaps as fast as under a week so don't get shut out! Details at www.greatamericanbeerfestival.com. Phantom Canyon Brewing (Colorado Springs) - The brewery has brought back an old style of beer called 1942 Burton Ale. Originally brewed by Barclay Perkins Brewery, Southwarke, London as the tide was beginning to turn for allied forces in World War II. Burton Ale is a practically extinct style named after the city that produced it. For centuries, Burton upon Trent has been associated with the brewing industry due to the quality of the local water. Burton Ale is a pale and well-hopped style of beer was developed in Burton in parallel with the development of India Pale Ale. You can try this brew on tap now at Phantom Canyon. If you were on their email list this week, you would have received a coupon for a free beer! It pays to subscribe. Name their new Hefeweizen and get a chance to win $100. Kannah Creek Brewing (Grand Junction) - August 2nd is IPA Day and who doesn't love celebrating beer! This is an open event for anyone that would like to join. One of their brewers Matt will be holding an informative drinking session in Kannah Creek's backroom. If you can't make it right at 5pm don't worry you can still join in whenever you get off of work. Their Broken Oar IPA will be $3.00 all day on August 2nd. Steamworks Brewing Company (Durango) - Ken, Spencer and BMc spent this past Friday in the “fish tank” at the brewery bottling a very special version of their “50/50” Imperial Pale Ale. This beer is a blend of our two biggest beers: The Conductor and Elephant Rider Imperial Pale Ales which were then "put to the wood" and aged for 4 months in a Wild Turkey Whiskey Barrel. It is on tap (almost gone) and available to-go in 25 ounce bottles at the pub. Better get some soon. Avery Brewing Company (Boulder) - Less than one week left before they throw down for their 19th birthday!! All-you-can-eat BBQ, live tunes, and BEER! If you want to try some extra special creations from the cellar, try out the VIP ticket. You can find the link for tickets on their homepage www.averybrewing.com. 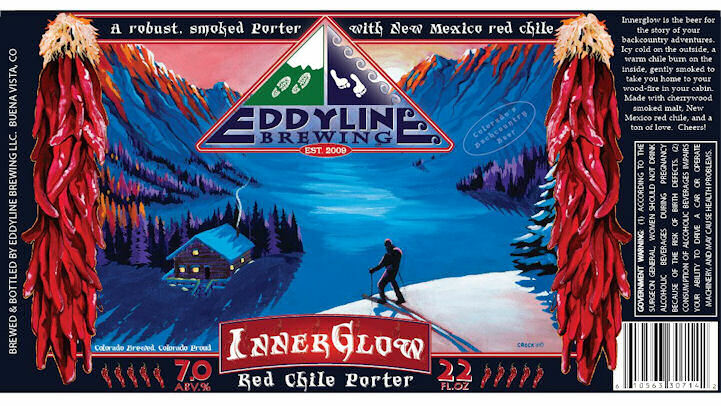 Eddyline Brewing Company (Buena Vista) - They submitted a new label for approval to the TTB for their Innerglow Red Chile Porter in 22oz bombers. If everything goes well, they should have these available in a few weeks! Described as: "Innerglow is the beer for the story of your backcountry adventures. Icy cold on the outside, a warm clile burn on the inside, gently smoked to take you home to your wood-fire in your cabin. Made with cherry wood smoked malt, New Mexico red chile, and a ton of love." Lowry Beer Garden (Denver) - Want to show your support for the people who helped fight the Colorado wild fires? Here's your chance. For every pint of Bristol Brewing's Laughing Lab sold, the Lowery Beer Garden will donate $1 to the Colorado Springs Fire Department Waldo Canyon Fire Gift Trust Fund. This offer runs through the end of August 20th, 2012. Hall Brewing Company (Parker) - Word on Facebook (a tip from the owner Aubrey Hall) says that he has a new brewery coming to Parker, Colorado somewhere in the Fall 2012 called Hall Brewing Company. The brewhouse is nearly completed now and official word on their opening should be forthcoming soon. No address given yet. They do have a website reserved but with no information on it yet. Bookmark: www.hallbrewingco.com. From their pictures on Facebook, it looks like they will have at least six 7-bbl fermenters in the brewhouse. This place has been in the works for well over a year. Stay tuned! The Mayor of Old Town (Fort Collins) - Have you been to one of their "Keep it Classy Cigar Nights at the Mayor? They're happening on Wednesday nights at 6:00pm. Come for the beers, socialize and light up your favorite pipes and cigars outside on the patio. #IPADay (Thursday August 2nd) - Where are you going to be to enjoy a nice hoppy IPA on IPA Day? Everyone is encouraged to imbibe an India Pale Ale on Thursday. Several local breweries and bars will be hosting IPA-related events and specials to help everyone the world over celebrate the hopulous delicious beverage called the IPA. Echo Brewing Company (Frederick) - At last! Echo Brewing has received 3 new tanks. Now they will be able to provide more Echo beer for everyone and do a few outside accounts down the road as well. Huzzah! Ironworks Brewery & Pub (Lakewood) - Their Vienna is now gone, but their Kolsch has now been put in its place. The Kolsch is a great summer beer that is light, dry and crisp. Stop by and cool down with this tasty beer. Freshcraft (Denver) - Join in on Thursday 8/29/12 at 7 pm to try some impressive barrel aged beers from Elevation Beer Co at Freshcraft. They'll be pouring two different versions of Elevation's Signal De Botrange Belgian Ale - one aged in Chardonnay barrels and the other aged in Cabernet barrels. They'll also be pouring a version of the Apis IV quad that was aged in red wine barrels. For good measure they'll have the "regular" (outstanding) Apis IV on draft plus a firkin of First Cast IPA aged with bourbon soaked maple chips. Don't miss this one! Crooked Stave (Denver) - The location of their new operation is: 1441 W. 46th Avenue, Unit 19 in Denver, CO 80211. It's just north of the Highlands in Denver, and very close to where I-25 and I-70 intersect. They have been fully moved in with all their equipment out of Fort Collins and on sight since June 29th! What that has meant is a lot of long nights painting and working to get the current spot up to Crooked Stave standards. The new location will not be their new brewery however. The plan is to continue to brew at two different breweries in Denver (Prost Brewing for one) and producing a wide range of the Crooked Stave beers they plan to release as year around and seasonal batches. Crooked Stave will have a taproom at their new location where anyone can come and drink Crooked Stave beers and take bottles home too!